Diabetes is a disease that makes it difficult for the body to properly process insulin. Just like with humans, cats can develop this disease. With feline diabetes, there are certain signs and symptoms you need to watch for in your furry little friend. Untreated diabetes can shorten your cat's life span. Type 1 diabetes in cats occurs when the pancreas doesn't produce enough insulin. Type 2 diabetes occurs when the body stops responding properly to insulin. Both forms of the disease result in the inability to process glucose in the body. This is also known as diabetes mellitus or "sugar" diabetes. There is also an unrelated and rare condition called diabetes insipidus that prevents your cat's body from conserving water. The most common sign is excessive urination. 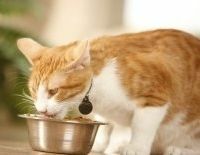 Owners often also notice excessive thirst, a huge appetite, and weight loss. Additional signs include: skin problems, an unkempt coat, liver disease, and bacterial infections. Some cats show hind-leg weakness (called neuropathy), which may get progressively worse. This impairs their ability to walk, jump, and play normally. Feline diabetes is more common in older, obese cats, and more often in males than in females. The exact cause of the disease in cats isn't known but has been linked to factors such as obesity, chronic pancreatitis, some medications, and diseases like Cushing's disease and hyperthyroidism. If you notice your cat is showing signs of diabetes, take him or her to the vet - early treatment can help to prevent complications. A physical exam and blood and urine tests will be necessary to make a diagnosis. A very small percentage of cats develop transient diabetes - a condition that resolves itself, usually a few weeks after treatment has begun. The prognosis for cats with diabetes is good. It's a treatable condition and your pet can continue to lead a long, happy life. Your vet will discuss with you any changes you may need to make to your cat's food or diet. If your cat requires insulin shots your vet can show you how to administer them. Most cats don't mind the shots as the needle is quite small. Oral medications are also available. Be sure to ask your vet what symptoms to look for if your cat is displaying signs of high or low blood sugar. Get instructions on what to do in these situations. Not all cats respond the same to insulin. Your veterinarian will determine the dosage your cat needs. Your vet will monitor your cat's condition and make adjustments as needed. Repeat visits to the vet to re-check blood and urine will be required to ensure that your cat's diabetes is properly controlled. Most diabetic cats will require lifelong treatment.